UVID International conference held on 10/10/2013. Our paper “Is More Information Better? How Dismounted Soldiers Use Video Feed From Unmanned Vehicles: Attention Allocation and Information Extraction Considerations” won the best paper award for research articles in the area of unmanned systems and human factors. The award ceramony will take place at the conference. 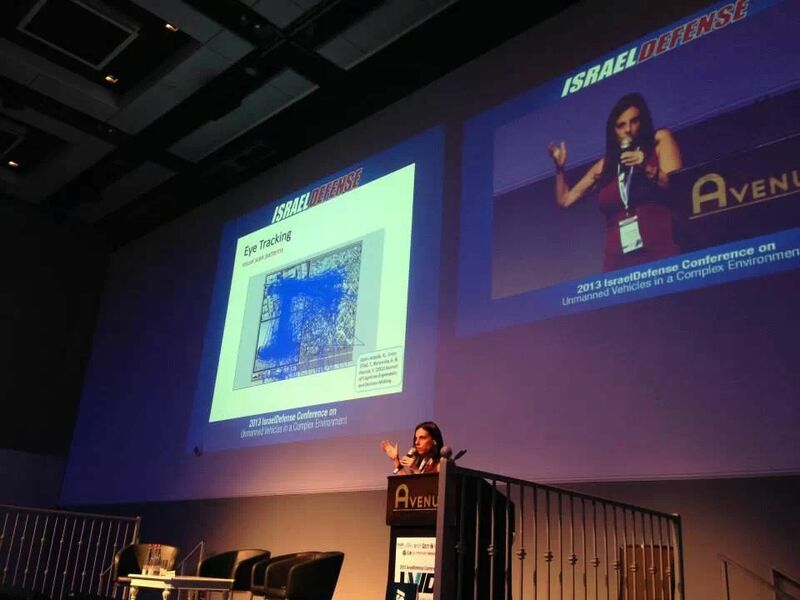 The ‘RICH’ (Rapid Immersion tools/techniques for Coordination and Hand-offs) research project is a US-Israel collaboration. The project aims to research, design and develop tools, techniques and procedures to aid operators in MOMU environments; to facilitate task switching and/or coordinate with other operators all for the benefit of improving overall mission performance.The Israeli partners on this task are Jacob Silbiger from Synergy Integration, Lt. Col. Michal Rottem-Hovev from the IAF, and Drs. Tal Oron-Gilad and Talya Porat from the Dept. of Industrial Engineering and Management. The US parents are Jay Shively, Lisa Fern (Human Systems Integration Group Leader, Aeroflightdynamics Directorate, US Army Research Development and Engineering Command (AMRDEC)), and Dr. Mark Draper (USAFRL). RICH is part of the US/Israel MOA (mutual operation agreement) on Rotorcraft Aeromechanics & Man/Machine Integration Technology. 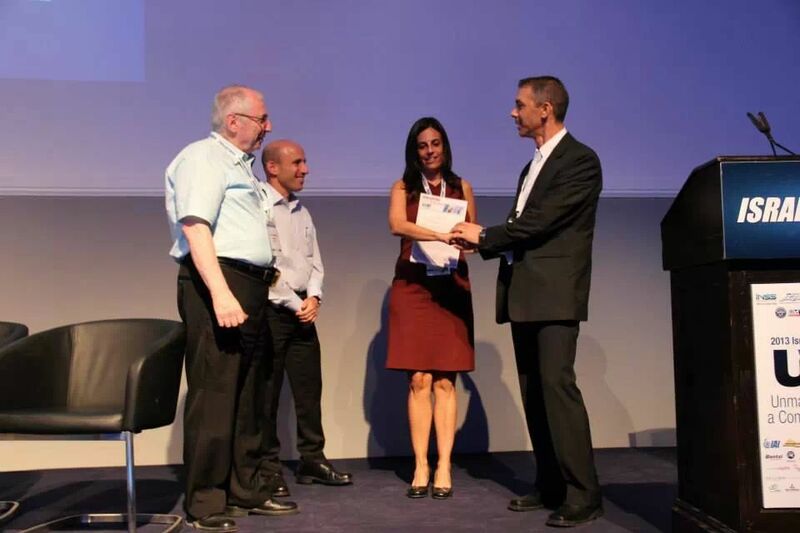 Here I describe in brief the goals of the Israeli team and some of the tools developed. Motivation: Multiple operators controlling multiple unmanned aerial vehicles (MOMU) can be an efficient operational setup for reconnaissance and surveillance missions. However, it dictates switching and coordination among operators. Efficient switching is time-critical and cognitively demanding, thus vitally affecting mission accomplishment. As such, tools and techniques (T&Ts) to facilitate switching and coordination among operators are required. Furthermore, development of metrics and test-scenarios becomes essential to evaluate, refine, and adjust T&Ts to the specifics of the operational environment. Tools: Tools can be divided into two categories: 1) tools that facilitate ‘quick setup’, i.e., aimed to ease the way of the operator into a new mission or area of operation; and 2) tools that facilitate on-going missions where acquiring new UAVs, delegating, or switching is necessary to complete the tasks at hand. The Israeli team focused primarily on tools of the second type. Some “successful” tools have been the Castling rays (see CHI paper for detail), the TIE/coupling tool, and the Maintain coverage area. Several outcomes of this effort have been presented and appear in the following conference proceedings. 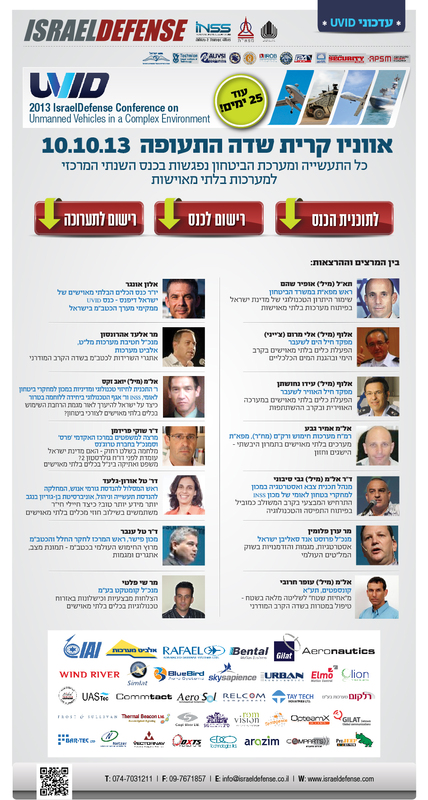 Tal Oron-Gilad, Talya Porat, Lisa Fern, Mark Draper, Jacon Silbiger, Michal Rottem Hovev and Jay Shively. Tools and Techniques for MOMU (Multiple Operator Multiple UAV) Environments;” , Human Factors and Ergonomics Society’s 55th Annual Meeting. Tal Oron-Gilad, Talya Porat, Jacob Silbiger, and Michal Rottem-Hovev. 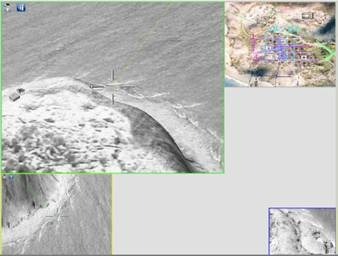 Decision Support Tools and Layouts for MOMU (multiple operator multiple UAV) Environments. ISAP Dayton OH, May 2-May 5, 2011. Talya Porat, Tal Oron-Gilad, Jacob Silbiger, and Michal Rottem-Hovev. 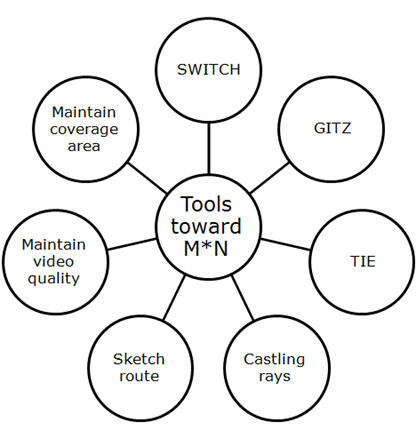 Switch and Deliver: Decision Support Tools for MOMV (Multiple Operator Multiple Video feed) Environments, COGSIMA, Miami, FL. Feb. 22-24, 2011. 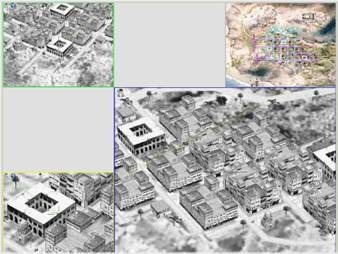 Porat T., Oron-Gilad T., Silbiger J, and Hovev M. ‘Castling Rays’ a Decision Support Tool for UAV-Switching Tasks. CHI EA ’10 Proceedings of the 28th of the international conference extended abstracts on Human factors in computing systems. One way to enhance soldiers’ orientation and SA is by adding various sources of information (including feeds from unmanned systems) to generate a broader perspective of the environment. 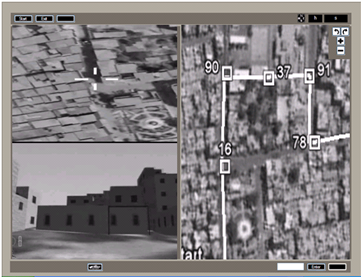 This is a demonstration of a key-hole effect, where it may be difficult to determine where in the map (left) the feed shown from the UAV is located. Researchers and practitioners have recently begun to examine the use of several types of unmanned systems combined. In order to do this well, it is important to minimize the visual load imposed on the soldier, a load that is obviously increasing due to multiple parallel displays. Additional views can increase operator comprehension of the situation but may also cause overload and confusion. Often, too many choices, characteristics and applications may even harm the operator as much as lack of choices. 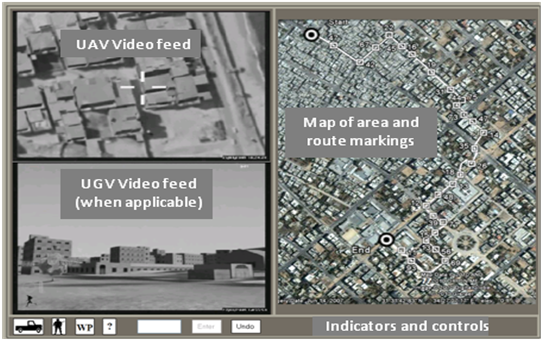 Our effort aims to examine the needs of dismounted soldiers in a multiple video feed environment (i.e., more than one source of information can be provided at a time) and to identify displays devices and interfaces that can support dismounted soldiers in such more complex intelligence gathering missions. Combining UAV and UGV feed. 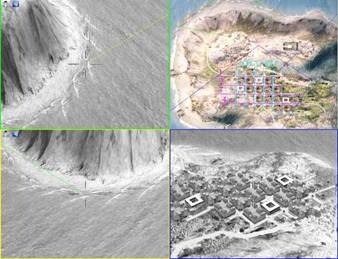 UAVs are meant to deliver the “larger” picture and are necessary for orientation tasks. UGVs are meant to deliver a more focused and specific image. Combination of the two should be advantageous when information is complex or ambiguous e.g., one may want to detect a target and then identify its features in more detail. 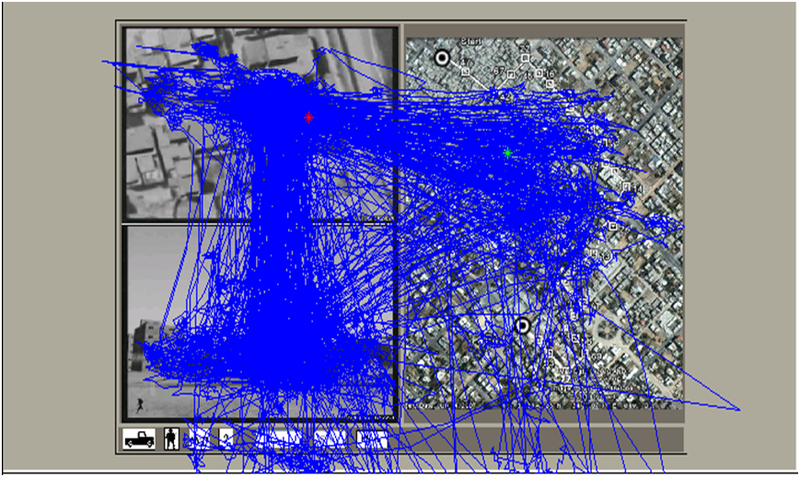 This is an example of a combined display, where both UAV and UGV video feeds are shown in addition to the aerial map. Waypoints of interest are marked on the map. Coming soon – experimental results of attentional allocation and performance on intelligence gathering tasks in such displays. You are currently browsing the archives for the UAV category.